Father Thomas J. Lane is a priest of the Diocese of Cloyne (Ireland) and is Assistant Professor of Sacred Scripture at Mount St. Mary’s Seminary, Emmitsburg, Maryland. He earned his S.T.D. from the Gregorian University and his thesis Luke and the Gentile Mission: Gospel anticipates Acts is published by Peter Lang Press. He earned his S.S.L. from the Biblical Institute and his S.T.B and B.A. in Ancient Classics from St. Patrick’s College in Maynooth, Ireland. 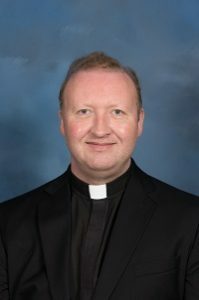 Having completed his studies and before coming to teach in the U.S., Father Lane was Assistant Pastor in various parishes for ten years, taught several courses on the Scriptures to adults in his diocese, and authored Parish Bible Study Courses for the Maryvale Institute in Birmingham, UK. He has made a number of recordings of talks and biblical meditations. Listening to the Word, a series of coursebooks on the New Testament published by the Maryvale Institute, Birmingham, UK, for biblical studies in parishes (co-authored with Dr. Petroc Willey of the Maryvale Institute).